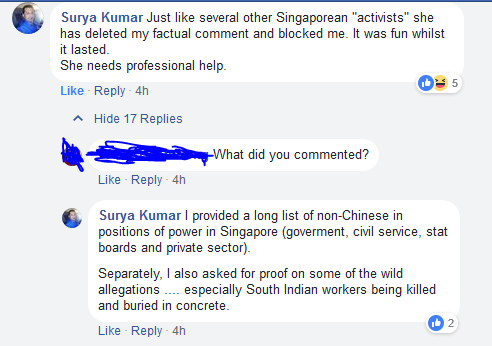 "Just like several other Singaporean "activists" she has deleted my factual comment and blocked me. 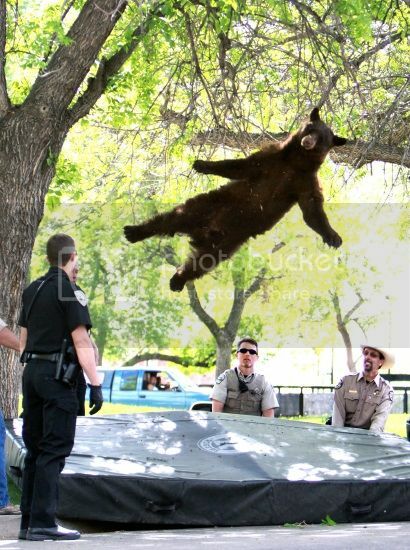 It was fun whilst it lasted. 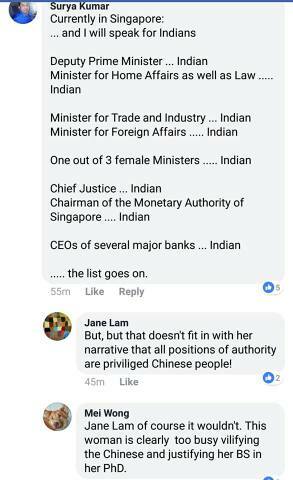 I provided a long list of non-Chinese in positions of power in Singapore (goverment, civil service, stat boards and private sector). Separately, I also asked for proof on some of the wild allegations .... especially South Indian workers being killed and buried in concrete." Curiously, I was unable to see Surya's comments on Sangeetha's post - nor could I (at the time of writing this post) see the screenshots of Surya's comments that someone had posted earlier (presumably in response to her deleting comments). ... the list goes on." "But, but that doesn't ﬁt in with her narrative that all positions of authority are priviliged Chinese people!" "of course it wouldn't. This woman is clearly too busy vilifying the Chinese and justifying her BS in her PhD." "Yeh where the malays that is 5 times bigger population than the indians. So something is wrong." "15 % Malays vs 7.4 % Indians is 5 times more? 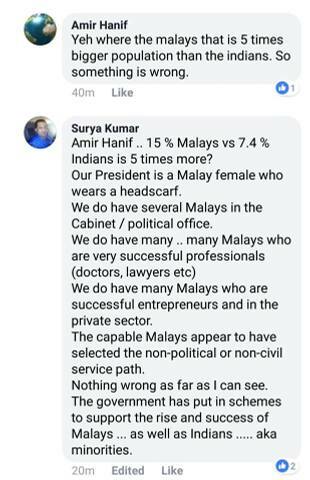 Our President is a Malay female who wears a headscarf. We do have several Malays in the Cabinet / political ofﬁce. We do have many Malays who are successful entrepreneurs and in the private sector. The capable Malays appear to have selected the non—po|itical or non-civil service path. Nothing wrong as far as I can see. One might ask why Sangeetha Thanapal, champion of minorities in Singapore, would be silencing a fellow minority who disagreed with her. One might also ask why she had left some other critical comments there. Presumably, she cannot abide being criticised by other Indians because then she can't claim to be the voice of the Oppressed Singaporean Indian. 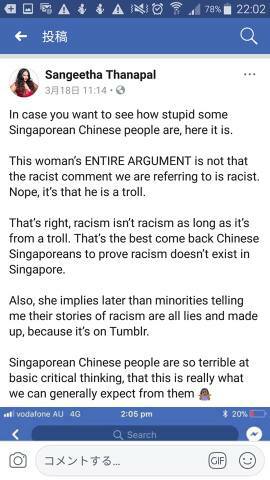 With the only dissenting voices being Chinese, she and her fanclub can label all those who disagree with her as racist because they're Chinese (i.e. having animosity towards someone else because of his race, which is the definition of racism). People like Surya deprive her of her standing (I've an Indian friend Shane Gill who also got blocked for calling out her nonsense). We can see parallels in how feminists hated Margaret Thatcher, and anti-racists and the black establishment hate Thomas Sowell. "Singaporean Chinese people are so terrible at basic critical thinking, that this is really what we can generally expect from them"